This entry was posted in History, Religion and tagged beard, Christianity, hair, Jesus, Jews, Judaism, long hair, Paul, Romans, short hair. I actually think Jesus probably had long hair in the Rabbinic tradition, but I would almost guarantee that His disciples had short hair. He never condemns them or teaches them otherwise. Remember also that Paul was a Jew first. In most cases, he went first to the synagogues and then to Gentile meeting places. He says, in the book of ROMANS, “For I could wish that I myself were accursed and cut off from Christ for the sake of my brothers, my kinsmen according to the flesh.” (9:3) Paul is extremely concerned for the Jewish people, but at the same time wants all men to treasure the Christ. How in the world can you be able to almost guarantee that Jesus’ disciples had short hair? No one will ever be able to know that for sure, or even be able to guess, at least not with the evidence we have. And it is indeed true that Jesus was very much ethnocentric, there is much evidence for this in the Bible and it has been pointed out and supported by numerous scholars of religion. Paul expands from the Jewish view of the world to be more inclusive of the gentiles, much more so than Christ does. For example, in keeping with Jewish law (as he wants to), Christ would require that his followers be circumcised, even the gentiles. This would be very off-putting to potential gentile converts, since anesthesia was not around at that time (and even if it was, recovery for this type of surgery as an adult or even a younger boy is extremely painful). Yet Paul dismisses this, which automatically expands the circle of potential converts. Paul was a very smart man! Brad, if all Jesus’ disciples had long hair and beards he wouldn’t need to comment on it, let alone condemn them. As for Paul, he was clearly one of those people who goes in and out of various religions, creating his own syncretist brand. There’s a lot of Mithraism in his teachings, and in fact his view of Jesus is more of Jesus as a Jewish Mithras than it is of Jesus as the fundamentalist Jew that he clearly was. I discount Paul’s comments about Jesus completely, they have no basis in any personal contact with him, but are the product of his epileptic seizures (as his “visions” were identified by Jews at the time). well you obviously see how you want to see it, even if its not an honest understanding of the text. Paul’s rendering of Jesus’ work and it’s importance and implication to us is 1000% consistent with the Old Testament understanding of Messiah. Paul wasn’t syncretistic at all. In fact the letter to the Galatians is entirely anti-syncretism (ie. Jerusalem Council AD 65, Acts 15). Paul is the most-Christocentric probably ever to live. It’s clear that you don’t really have a problem with Paul, you have an issue with Jesus. And in that discussion, you will not be able to use Paul as a scapegoat. It’s clear that you are learned and I don’t mean to start an argument or even to debate facts. I wish you peace and happy blogging. Long live pig-eating, uncircumcised, beard-shaving idolaters! I always had the impression of Pilate as a reasonable guy. That impression continues, only now I see Jesus as the backward extremist that he was. I suspect Jesus and Osama Bin Laden would have gotten along very well together. Osama would have been right there in the cleansing of the Temple, as well as in running that herd of 2,000 pigs over the cliff. First Casey, your ad-hominem comment shows you no nothing of the Bible or your just being lazy. and It had no relevance to add to the conversation. Second Robin, This blog is a reminder of what happens when you read just a select few verses and do not read the entire paragraph, chapter, or theme of a book or letter. It’s like you googled “hair” on a Biblical website and found verses that seeming contradict and bam, the case is closed for you. Bad technique. Here’s what I mean: Here are the context of the verses used. And don’t take my word for it, read it for yourself, please. Leviticus 19:27: In proper context this verse refers to the cutting of hair because of morning over the loss of someone who died. It was a common pagan practice that the Jews took in to their own religion and God wanted them to not be like other religions. You can see the other Old Testament scriptures that give more detail and back up the context. Leviticus 21:5, Deuteronomy 14:1, 15:2, Isaiah 15:2, Jeremiah 16:6, just to give a few for reference. The verse next verse Leviticus 19:28, gives the context about cutting your body or put marks on your body “for the dead” puts it all in context. I could stop there because this makes the whole blog fall in context but I feel the need to point out that Paul was not the anti-Jesus person you claim. 1 Corinthians 11:14: The letter of 1 Coriinthians wriiten by Paul was written to address several issues in the church there. (read chapter 1) Corinth was a city that was very sexually immoral and was full of many different practices from other religions of the day. Paul begins his letter to the church with stating the most important thing, “And so it was with me, brothers and sisters. When I came to you, I did not come with eloquence or human wisdom as I proclaimed to you the testimony about God. For I resolved to know nothing while I was with you except Jesus Christ and him crucified.” The issue of hair in chapter 11 was just a another small argument that Paul was addressing the church about. Paul didn’t care about what people did with their hair. His statement “Judge for yourselves” in verse 13 shows that He was leaving it up to the local church to decide what they felt was right as far as worship goes. You can see his attitute about the law in chapter 10, verses 23-33. The rest of Pauls writtings stand for themselves and you will see that they do not contradict Jesus teachings or the Old Testament. I’m just one sinner saved by grace trying to help others find the joy and peace I have found in a relationship with Christ, I would love to dialog with you more if you have other questions. I don’t know everything, but I will be glad to share what I do know with you. Thanks for reading this novel of a response. God Bless. 1 I was a devoted bible student for 30 years. 2 your overwrought rationalizations are not impressive. More ad-hominem!! I’m open to hearing your ideas if you want to share them, but you obviously enjoy being closed-minded and intollerant. John, this blog is dedicated to providing a big-picture view of the words and actions of Jesus within the context of the 200 years of uprisings against the occupation of Palestine by the Romans. Perhaps you don’t know that when Jesus was about 12 there was an insurrection at Sepphoris (or Zippori, to the Jews), the capital of Galilee, just four miles north of the village of Nazareth. 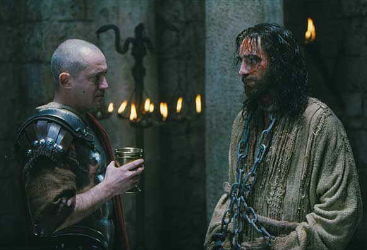 The uprising was led by Judas of Galilee, it was crushed by the Legio X Fretensis, and the Romans crucified 2,000 Jews. You will notice that Joseph is not mentioned again in the Gospels after this time. But whether Joseph was killed in the uprising or was crucified by the Romans, or not, it would have been a traumatic and formative experience for the young Jesus. Read more history. Think about it, and re-read the Gospels. I have heard of the mass killing and I will read some of your thoughts about the influence of the Romans on Jesus, but I think that you would need to show me some more evidence behind your theory first, perhaps it’s in your book, I will find out. Are you saying that Jesus was Anti-Roman because of the mass killings because I just don’t see much of that in His teachings. Jesus teachings aside, He made some bold claims “to be God” that would be foolish to make without being able to back them up.